Have you seen our latest video of ISO 4406 testing? Noticed the additions to our fleet of filtration rental equipment? In the market for a high-quality hydrocarbon fuel filter? In this short video we highlight the results of a recent ISO 4406 test conducted in-house for a pipeline customer seeking to provide “cleaner” ultra-low sulfur diesel to their end-user customers. We tested a sample representative of what is coming right off the pipeline, determined the level of contamination, then measured the level of contamination after a single pass through our high-efficiency Beta 1000 Microglass Filter Element. While it is not common practice at this time to utilize standard ISO cleanliness codes to evaluate fuel quality, this test provided an excellent method of measuring the level of particulate contaminant present, and the efficacy of our filter media in a diesel application. The results were fantastic! Click here to learn more about the ISO 4406 cleanliness code and how to achieve your target! 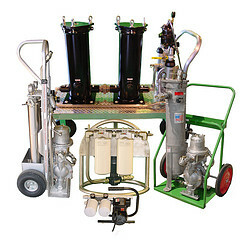 Have you seen the recent additions to our fleet of rental filtration equipment? You name a portable filtration system and we have it available to rent! It doesn’t matter whether it’s a filter pressure vessel, a filter bag or cartridge housing, a portable filter cart, a vacuum dehydrator, or an oil flushing skid. Do you have an emergency filtration situation? Perhaps you need to transfer and/or replenish fluid? 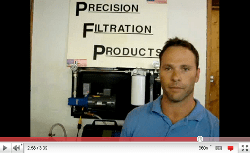 Don’t want to invest a large amount of money into an expensive permanent filtration system? Renting may be the best option for you! 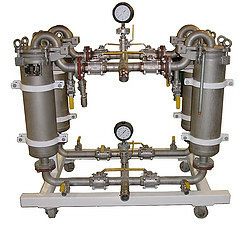 Our rental filtration systems can be used for any number of various applications, including but not limited to, particulate removal, liquid coalescing and separating, turbine oil conditioning, refinery upset conditions, varnishing, filtering amine glycol, hydraulic reservoir maintenance, and emergency fluid spills. All of our filtration equipment rentals are available in stainless steel or carbon steel. A complete system can run flow rates of anywhere between 5 GPM to 5,000 GPM and beyond. 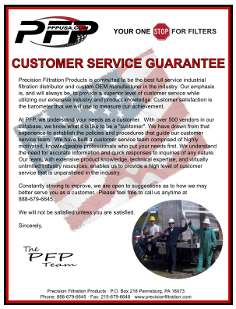 Click here to learn more about our Filtration Rental Equipment fleet! The newest FBO hydrocarbon fuel filter assemblies are designed to meet the toughest refueling conditions and provide for ease of cartridge change-outs. 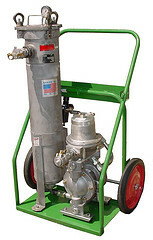 The FBO filter assembly can be used on mobile refuelers or installed in refueling cabinets. The unit can also be used for diesel fuel dispensing pumps or as a primary fuel-water filter separator for large diesel engines. The assembly features a locking-ring collar, which attaches the filter housing to the aluminum die-cast filter head with four bolts. The slotted locking-ring collar allows maintenance personnel to hand-loosen the four collar bolts and simply rotate and lower the bowl assembly for quick and easy cartridge change-outs! With a new cartridge installed, one raises the bowl and rotates it into position on the locking ring, then hand-tightens the collar bolts evenly. That’s it! The closure hardware consists of stainless steel nuts, bolts, and washers with metal hand-knobs for ease of maintenance. One person can easily change the filter element. No wrenches or other special tools are required! (100 lb-in. torque is highly recommended.) For more information on these FBO hydrocarbon fuel filters, click here to see all the features, options, and performance specifications! Click here to see more of our hydrocarbon and aviation-specific filters and filtration systems, including fuel-water filter separators! ← POLL: Are you CONSISTENTLY hitting your target ISO cleanliness codes on your critical equipment?